Today is an exceptionally dismal day here is Portland. It's pouring rain, cold, the wind is icy, the air is damp. Even with the heat on, I'm still bundled up. I have my second cup of coffee just to stay warm, and I've spent the day in my workspace using the steam on the iron for anything I can think of. It's the perfect day to work on sewing jeans. It's been a while since I've tried to sew jeans; I'd forgotten the hassle of switching out the topstitching thread all the time. I could bring out my Gee Betty's old sewing machine and set that up, but I just don't have the space. 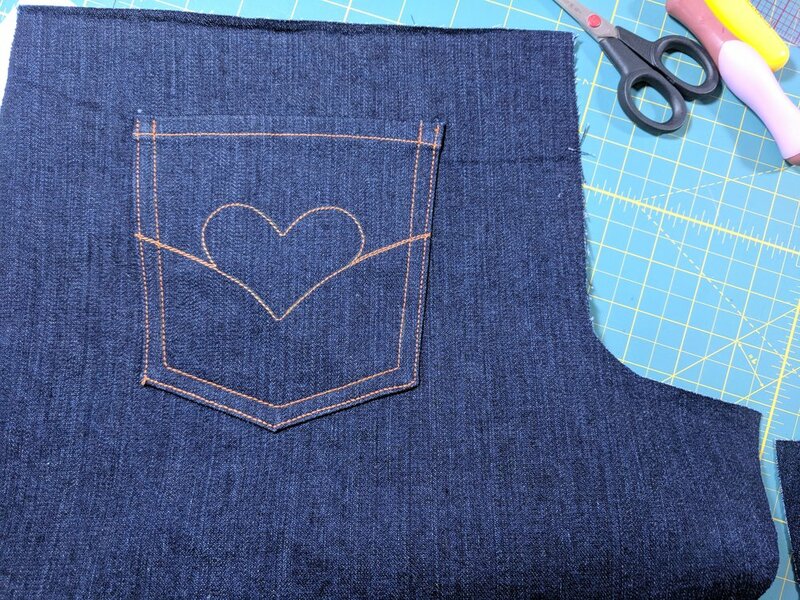 A lot of sewists avoid jeans because they are nervous about all that visible topstitching, or about getting their machines to stitch through all that denim, or they just don't feel up to tackling a zipper-fly. As I have fumbled through this project, I have had to dredge up the things that I know about sewing with thick fabric and thick thread and zippers. It really isn't so bad...and full disclosure, I've unpicked a few seams. 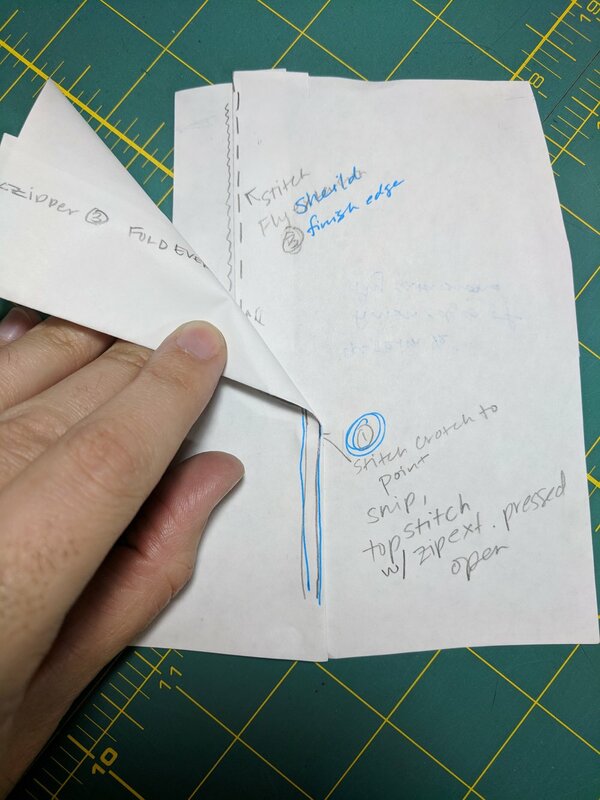 Last spring when I was in Patternmaking classes, my teacher helped me make this handy 3D model of a zipper fly out of paper. Pictures and instructions are great, but I always do better when I can get my hands on something. The process of making it, even though I already knew how to sew a zipper fly, was still immensely helpful to both drafting, and sewing my own. I recommend this little exercise if you are feeling uncertain about sewing a zipper fly. Topstitching a special design onto the back pockets can be intimidating. To make my design, I cut out a template of the pocket piece, marked out the center lines vertically and horizontally, then sketched out my design being sure it was symmetrical. 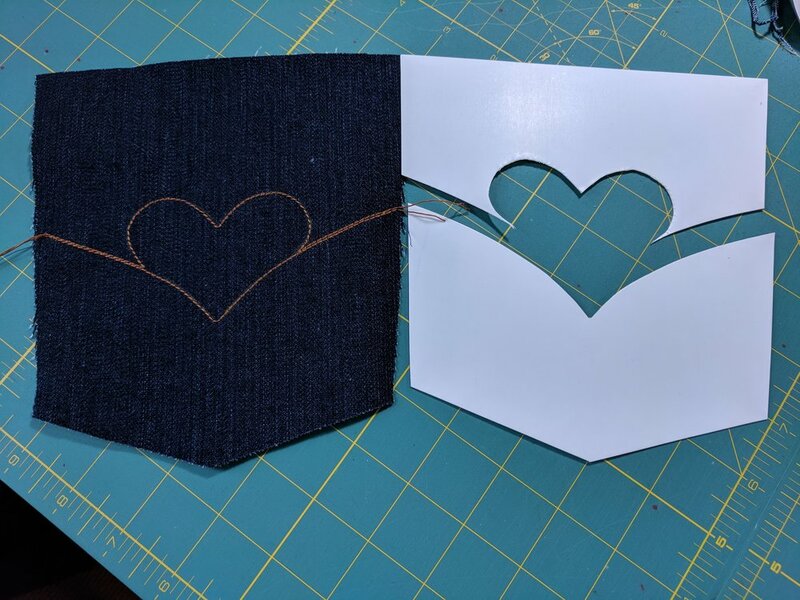 Next, I cut the template along the stitching lines and used a chalk wheel to trace my stitching lines onto the pocket pieces. If you are using genuine topstitching thread, it is very thick and can snag and pull and break in your machine. The trick to prevent this is to use a larger needle. I found that a size 90/14 was still too small and bumped up to a 100/16. If your needle is too small, the hole it makes will be too small and drag at your thread. It's the same strategy for thick fabric. I'm using a size 100/16 denim needle for all regular stitching. You can always choose to mock flat fell your seams, finishing the edge, press to one side and topstitch, but it isn't as strong as a real flat felled seam. The crotch seam has always given me a bit of trouble, but this time around I think I've figured it out. My pattern has an almost 90 degree curve in the back, so to help the seam allowance turn for the flat fell, I clipped tiny notches just short of the fold line (NOT to the seam line). It just gives the seam allowance a bit more motion in the curve. Hopefully I will get these finished up in the next day or so and I'll get to see how they fit. In the meantime: gratuitous kitty floof. Part one here.